We provide our clients with a complete departure checklist. This list is very helpful to make sure everything is set for a long term absence. During our first visit, we verify all items and if you forgot anything, don't worry, we will take care of it for you. 1) Irrigation, watering tips and restrictions. 3) Toilet leaks, how to find out? 4) Storing your car for an extended period? 5) Coach lights and occupancy lighting. 6) Furnace and A/C air filters maintenance. 7) Not home for a while? Water evaporation experiment. 8) Not home for a while? Be proactive. 10) How to clean/shutdown your bottled water dispenser. 11) Do you know your water valves? 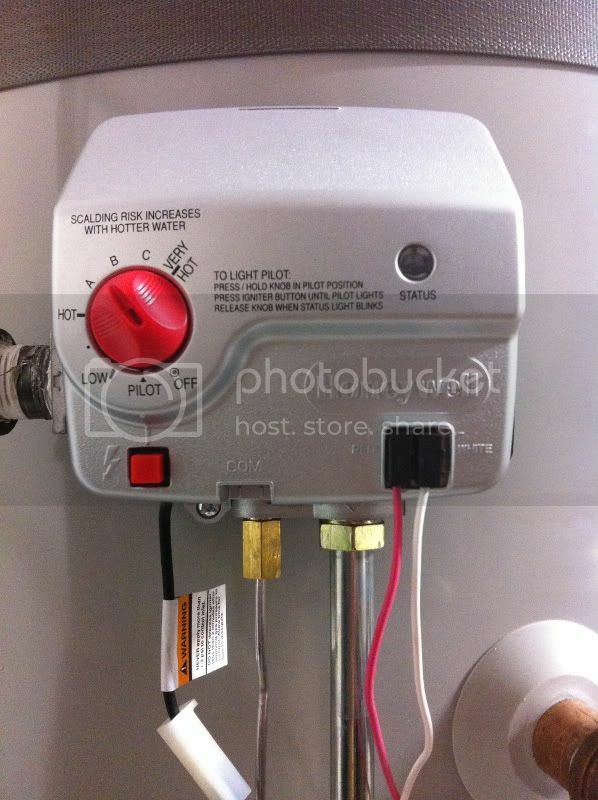 12) Gas water heater operation, shutdown and start-up. 13) Water Softener Shutdown and Start-up. 1) Irrigation. Watering tips and restrictions. ﻿While you are absent, Home Watcher LV will adjust the irrigation timer schedule to comply with the watering restrictions in effect. Drip systems. Watering tips from the Southern Nevada Water Authority. Here. Mandatory watering restriction. 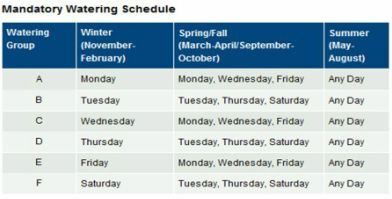 Follow this link for the schedule. Find your watering group here. It is critical that all windows, doors and gates are locked. First floor windows and doors should have two devices to keep them closed. Since many single lock devices can be defeated easily , a wooden stick or metal bar across the window or door should be set for additional protection. Yard gates and exterior breaker electrical panels should be locked as well. If a landscaping or pool service need access to the yard, give them a key or use a coded lock. If your front or rear door dead bolt and doors are not reinforced, consider installing a long striker plate as shown in our Home Maintenance Tips. Is the toilet leaking in your unoccupied vacation home? A leaky toilet can waste 22,000 gallons per year! An old flap is the cause of most water leaks. Once a year, you should inspect the flap of each toilet. If the flap is more than 5 years old, not flat or looks deformed, it's time to replace it. Its inexpensive and easy to do. Follow this link for more information on how to test it. 4) Storing your car for a while? Fill the fuel tank up. Check tire pressures, More info here. A variety of smart timers. It is a good idea to have your coach or occupancy lights on during the evening. It is not a good idea to leave them ON all the time. It would be a noticeable sign that the home is unoccupied. A smart timer can turn the lights ON at dusk and OFF at 11:00pm or any other time. Most timers can be programmed to turn a light ON and OFF several times a day. Timers cost between $5 and $30 and depending on the model, many models will work with with high efficiency lighting such as CFL or LED bulbs. During an standard inspection, Home Watcher LV will turn the occupancy light ON and OFF to ensure that it is working. If you do not have occupancy lighting, we can set it up for you. 6) Furnace and A/C air filters. Changing filters way too late. The replacement of air filters is critical for the proper operation your heating and air conditioning system. A dirty filter will result in a significant increase in energy cost and discomfort. At the very least, air filters should be changed in between heating and cooling seasons. The filters should be changed sooner under conditions such as smoking, presence of animals, open windows and any activity creating smoke or fine particles, etc... Inspect your filters monthly. If you are to leave for an extended period, change your filters before you leave, this will allow the cheapest and best performance from your heating and cooling systems. Air conditioning is very expensive, change your filters and save money. There are many opinions about which air filters to use. I prefer to use good pleated filters, they last longer, collect finer particles to keep the air, evaporator coil and ducts clean. Do the right thing, change your filters because if the filters are no longer working well for you, your lungs will. 7) Not home for a while? Smell something? The Las Vegas area has very dry climate, relative humidity (RH) can be very low for several months. Water evaporation is not only significant for outside pools, it can be a huge problem in an unoccupied home. The toilet water seal can evaporate in less than five weeks. When the water seal is gone in a toilet, sink or bath tub, it allows sewage gas and insects to invade your home. Not a pleasant experience for when you come back. Today, June 18, 2012 the relative humidity is 4%. How soon will the toilet be dry? 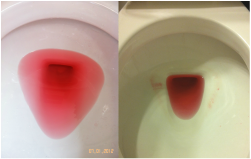 Red plumbing antifreeze was used for this experiment, clear city water would have evaporated faster. This is preventable problem that Home Watcher LV will avoid for you. - Have a Home Watcher inspect your home regularly and perform unoccupied home maintenance tasks. Stop your newspapers and magazine subscriptions. Destroy of lock-up all personal information (Credit card statement, utility bills, checks, social security cards, etc. Do not widely broadcast your location on social media. Hold or redirect your mail! Here is the USPS link to hold your mail. HERE. The recommended procedure is HERE! Primary and secondary water valves. ​We often get the comment from homeowners: "All my piping is copper and it will last a lifetime". Think again, what about the plastic connections to your faucets, refrigerator, toilets, water filter, etc. Will they last a lifetime? Will your rubber toilet flaps or water heater last a lifetime? We all know the answer. There is a significant risk if the water pressure is left ON. A disaster will happen, we just do not know when. This is a preventable situation. Which valve should be shut off during an emergency or when you leave? In the city, your water supply can be shut off from a valve near the street, but inside your home, the valve shown on the left above is your main water valve. This is possibly the best location to turn your water off, however be careful, this valve may also shut off the water supply to your irrigation system. To find out, start your irrigation system in manual mode and verify that your plants or lawn are being watered, then turn the main water valve off. If the irrigation system continues to dispense water, good news, you can shut down the water at the main valve. If the water flow stops, you will have to use an alternative. In many homes of Southern Nevada, you will find a water line loop coming out of a wall, probably in the garage (above center). 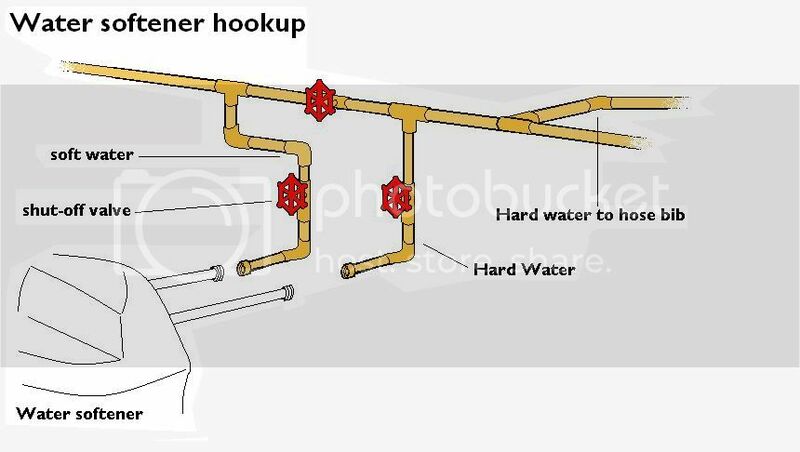 This loop is normally used to connect a water filter or a water softener. If you already have a water softener, then you may already have a shut off valve near the water softener. If no valve or water softener is installed, a simple ball valve can be installed to the loop as shown above. This valve is the second best location to shut off the water to your home when you are away. When closed, only cold water may be available to your irrigation system, possibly exterior spigots and kitchen faucet. This is a small investment that can help you sleep better at night. 12) Water heater operation, shutdown and start-up. Gas water heater controls and warm water recirculation pump. When you leave your home for an extended period of time, water pressure and temperature should be reduced to a minimum at your water heater. First, mark the normal operating set point at your water heater controls. (It should be about 120-130F). This is your reminder to know where to set it when you come back. Then, lower the temperature setting to "Vacation" or "Pilot". You can also turn it completely OFF, but you will need to ignite the pilot when you start it up again. If your home is equipped with a warm water "recirculation" pump similar to the unit shown in the picture, disconnect it from the wall outlet. Many of these pumps will run until warm water is distributed throughout the home. If no warm water is available, the pump will run continuously 24/7. Finally, turn the water pressure OFF (see article 12 about water valves). Bon voyage. When you come back, open a hot water faucet in the kitchen, then open the main water valve slowly. Set the water temperature to your "marked" desired setting. As you do this, you should hear the burner light up. If not, check the pilot and follow the instructions on the heater to light it up. Reconnect and adjust the clock on your "recirculation" pump (if equipped). Let the hot water faucet run for a minute or two, then turn it off. Welcome home. Water softeners come in multiple shapes and models, some have electronic timers with water flow meters while other older units are designed with a mechanical clock. During your absence, most newer models with and electronic control head and water flow sensor can be left connected and not in bypass mode. 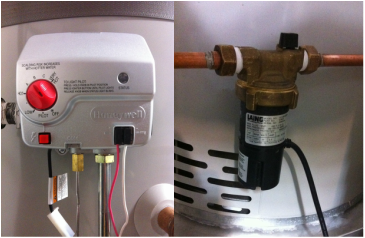 The picture on the left shows a valve set-up commonly used for a water softener. Basically reverse the current position of the three valves to bypass the softener if desired. Verify your user manual for shutdown instructions. If you remove power, you will most probably have to set the correct time when you reconnect the unit. Verify that you have at least 6 inches of water at the bottom of the empty salt tank and clean the tank as necessary. It is best that you initiate a regeneration cycle to properly flush the unit when you return to your property, otherwise, the unit will resume operation where it left off. For more information, follow this link. Call Home Watcher LV at (702) 767-4175 or Contact us here. Home Watcher LV assumes no responsibility for the content herein. The content is intended to provide general guidance. It is the responsibility of the reader to follow the manufacturers' instructions and verify compliance with any laws, codes and regulations. For any concerns, please consult the manufacturer or a licensed professional.